Hey all. Here's my project car (google photos be kind: I might have to transfer to flickr if these don't show up for other people): It's a 1965 122S. According to this chalk-drawing, the Nissan (actually this is its older brother the s14 chassis, but it'll illustrate (no pun intended) my point) is 2525 foreign measurement thingies long, and either 1480 or 1470 numbers wide depending on which end of this car is the one that usually goes forward. Honestly, it's hard to tell which end that is from this cave painting, but I digress. I would've thrown this whole project out with the bath water if I hadn't seen that beauty. That's a helluva car! It happens to have a Nissan Skyline rolling bits underneath it, which are not only similar to my crappy Nissan, but the rear sub-frame is almost identical on both Nissans. So, that leaves the small detail of the width...well actually it doesn't if you look not-at-all closely at that Volvo, the wheels are wider than the car (I know, you may have missed it the first time (these past few phrases have been sarcasm if you couldn't tell)). So, that's the goal then. Wait, that's not the one you were thinking of? Well, you mustn't be me then! Anyway, stay tuned for updates as I bravely go where at least that one other Swedish guy went before and swap some Neon-80's Nissan rolling gadgetry under a Volvo from the golden age, with the heart of literally millions of trucks! It should be a fun ride! Great plan and great story telling. Looking forward to watching this develop further. Loving all the 122 builds going on now. Looking forward to your progress. SR20s will pull a premium until the end of time. 7.5 HP 240 Volt Air Compressor and hoses/fitting, etc. So, that kept me from actually doing cool stuff, but now I'll be doing more of the cool stuff. You'll have to excuse the mess. The garage was "cleaned" because we had a vermin infestation so everything had to be hastily reorganized and I've been making too much progress to get distracted with cleaning. Note the unnecessary spring compressor and the superconductive electron decibel conduit used for stabilization (that's Pretengineering speak for audio cable used to prevent strut flying). Should be a very nice upgrade from the cavernous snout it will be replacing. After that, it's on to the rear subframe! Huzzah! Stay tuned for more updates soon! Wowzer! That's a dem fine looking gantry you got there! Not a bad idea to use some industrial shelving for the sides. When you look at the state of this Nissan, you can't help but question your own sanity in wanting to reuse any of it. But, it's free and I'm already mentally committed. You can see in this pic the strut bar and the sub-subframe bits. Those came off separate for a total of three stamped metal pieces I'll be transplanting. Disconnected the steering, and power steering lines and the rest was as easy as violently lowering the whole thing onto the garage floor in a screaming metal cacophony of victory! Public Service Announcement: Don't let anyone tell you you've used enough kitty litter. People who say those things aren't friends, they're kittylitterists and are not to be trusted. Sorry to any who have been waiting on baited breath for an update of my rather stupid project. Suffice it to say I have been hard at work and making steady progress on stuff that isn't exciting. But that's no bother. I paid $650 for the entire car. I'm hoping to part out something of the rest of it to at least get a further discount on all the parts I'm getting off of it. In the mean time I've been pulling subframes of the Nisan 240sx and cleaning them up, taking the steering input shaft and steering wheel out of it and generally harvesting anything of value that I think I might need before it goes to be that beautiful drift track in the sky (the dismantler). Any thoughts on other stuff I might want to grab from either of these Nissans? I have a guy an hour and a half away who's only job it seems is selling LSx Chevy stuff. I've dabbled back and forth between getting an overpowered 6.0L LQ or an overpowered 4.8L for half the price? 6.0L will make generous power if you look at it funny, the 4.8 takes more massaging and more money but is highly respectable especially when in its stock form makes about 260 hp. A modest upgrade from the double digit horsepower the 122 has in it currently. Anyhow, much more to come soon as I actually start dismantling the 122 in July! Last edited by SML; 07-20-2018 at 12:17 PM.. This is going to be rad. Keep it up! I'm trying! This project is a foolish thing to do when you've got an 8 month old and a 3 year old bouncing around, but hey! I've always made a little progress on something every week since I started, so thanks for the encouragement! The biggest hurdle now is trying to get the shell of the 240sx out of my garage. I don't own a trailer and it's got no rolling bits to tow it. I've tried to hit up some scrap metal haulers on facebook marketplace, but no one's biting. TRConn recommended cutting into pieces and at this point I either do that or waste money on a hauling company that charges for this sort of thing. Also, here's my future shift knob! Yes, I nerd that hard. This stupid Nissan has been fighting me the whole way. Damn thing was tipping this way and that, wobbling and a walking. But I solved the mystery of its odd weight distribution. It's got a gateway to the negative zone located in the trunk which is where the Incredible Hulk gets his mass. That's what I call slammed! That stance tho! You can see all the counterweighting I had to do to make it come down in a straight line. I found a guy who will pick this up for me for $50. I couldn't get scrap haulers to bite. 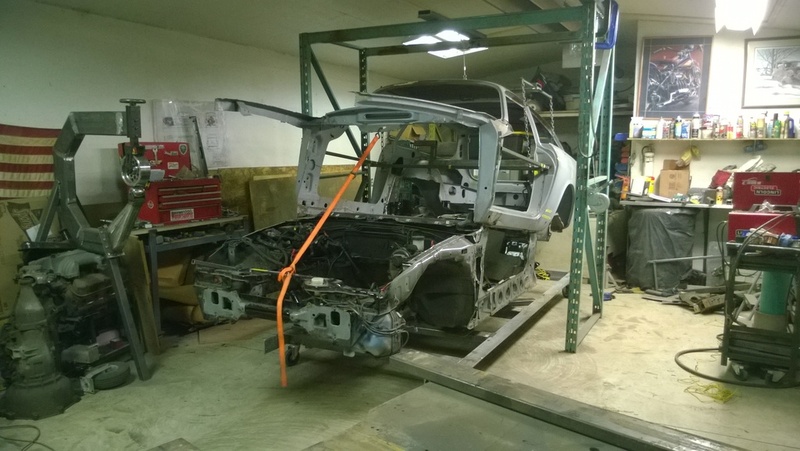 Little did I know that scrap yards pay less than half of their normal rate for incomplete cars. In its current form, might be worth $30 in scrap and therefore not worth the time. So, some wheeling and dealing later and I got ripped off of some hard earned cash for this "low mileage" 5.3L Vortec. It's an '03 and it looks...just a little older than that. So, "no regrets," since every body and their mother selling a LS V8 on CL, facebook and everywhere else is either flakey, dishonest, unresponsive or all three, so at least this one is in my possession. I then spent a little time on clean up of the subframes. Believe it or not, these have had some dirt removed from them. Coming soon, I'll strip them apart, re-bushing everything and paint some gaudy shade of orange like all the cool kids. 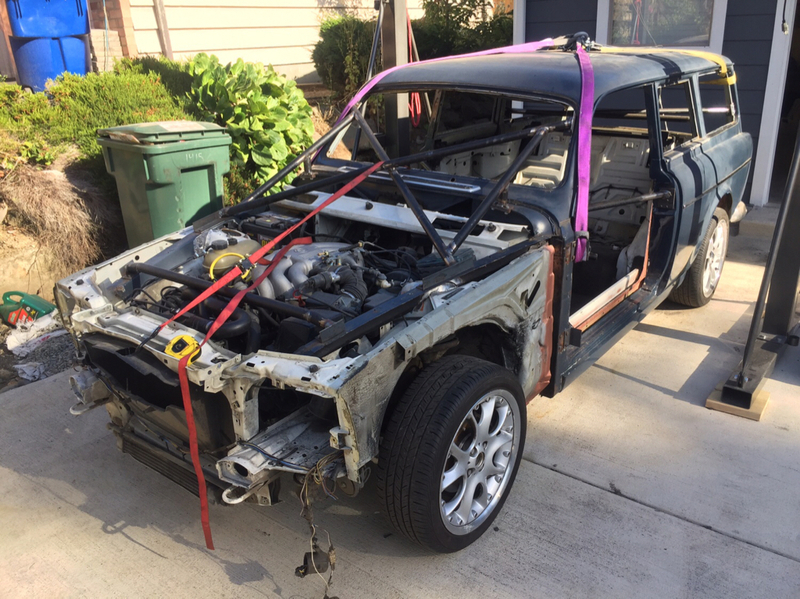 I've also been doing research and asking embarrassing questions to display my ignorance, about the LS harness and how to make it work with...literally nothing on my Volvo since it's all broken anyway. Well, a new solution came to mind. Ordered a Bluetooth OBDII Thingamajig and a Kindle Fire HD8 which, when combined with the Torque Pro app, will give me lots of options for digital gauges and hopefully none of stress of trying to find a new dash then make a motor from '03 talk to gauges from '65. Got this stuff on Prime day, and combined with a gift card I got from my mommie for my birthday, I'm happy as a clam with this decision. Hater's gonna hate, but I'll make it look clean as a christian comedy when it's all mounted up in the dash. More to come at the end of the week, and thanks for tuning in. Last edited by SML; 07-20-2018 at 12:33 PM..
Want to say that I dig the name of your project car. Tom MarVolvo Riddle! Too funny. And here I was thinking no one got it! Cheers! Pics broke in the last post for anyone else? It pooped out a roller skate along the way, but the tow truck winch didn't care a hoot. Good riddance to bad rubbish. The good news is I can see the floor in my garage for the first time in forever. Time to put something else that won't move in there after I clean up a bit (a lot). Last edited by SML; 07-20-2018 at 12:26 PM..
Pics in two previous posts don't work for me either. Except for the one picture of garage floor, for some reason. Still trying to get my mind around a Harry Potter fan doing this cool Volvo build and also using a 20 sided die as a shifter knob!!! Love it! Looking forward to the continued progress! That's just the weirdest thing I've ever heard. They're all in a public folder on my Google Photos. I just re-shared the album, so maybe now it'll work. Thanks! I'm just a regular nerd. I like beer, cars, D&D, Harry Potter, church...the list goes on. The more people I find who crossover into more of those categories, the happier my life gets! Hioh! Imgur seems to be the best hosting for me, just remember to click huge thumbnail or else you get huge pics. Love the shifter btw.